Spoiled. Bratty. Pompous. Pretentious. What a list of adjectives to describe G.L.O.R.Y. Girl Kylie Pierce. And the amazing thing is...she's proud of it! Ms. Pierce has become someone that the fans love to hate. But that doesn't concern her one bit. The only thing Kylie cares about is winning. Well...that and looking good! The bratty and spoiled Kylie Pierce. Kylie and her equally arrogant tag partner, Fate. Kylie with an illegal choke from the ring apron. How pompous can you be?! Kylie heads to the ring wearing a tiara! It's obvious from Kylie's expression that she disdains the fans at ringside. Pink and black never looked so good! Hair: A stunningly gorgeous hue of chestnut brown. Eyes: The most dazzling mix of every eye color!!! How It Started: I was spending the night at my best friend's house one night in 2000 (I was 14) and she basically made me watch wrestling on TV. After a while, I really started getting into it once things were explained to me. Ironically, a few months later she stopped watching it completely. In 2002, I found a local wrestling school that held all day try-out camps during the summer. I went to two of them and loved it. From there I scraped up the money to train. Gimmick: Basically, the bratty, spoiled, little rich girly-girl image. Fate (my partner) and I ALWAYS win and do whatever we have to to ensure that (usually that includes spraying our opponents in the eyes with hairspray). Wrestling Style: I love a lot of old-school stuff! But I have been training with some great Lucha/Japanese-style wrestlers whom I learn a lot from. Gear: Skirt, tank top and my boots. Right now, the black, pink and silver outfit. Hoping for more soon! Titles Held: EWA Tag Team Championship (with Fate). Biggest Win: Winning the tag belts from Derek Fraizer and Stevie Riggs. Worst Loss: I don't lose! Favorite Type of Match: Gosh, hard to say. I love both tag and singles matches. Mixed tags are cool too. Not really a fan of gimmick matches though. Favorite Moves/Holds: Modified Bow & Arrow; Octopus Stretch; lots of pins...particularly the Mousetrap Pin. Finisher: Singles: I always change it up! Don't want my opponents predicting anything. Tag Team: Double Hanging Man DDT with Fate off the top rope (she can't read my mind, so we have to be on the same page). Biggest Allies: Of course Fate, my tag team partner! Besides her, I'd say basically anyone that I've learned something from and trained with. Some of the people I have been fortunate enough to train with regularly are Terry Taylor, Chris Hero, Mike Quackenbush, Ruckus, Derek Fraizer, DJ Hyde, Sabian...gosh, I could go on forever! Most-Hated Enemies: Anyone that thinks they can beat me...and ugly people. Toughest Opponent(s): I've had some strong competition: Gail Kim, Daizee Haze, April Hunter and Sumie Sakai. And even some guys like Derek Fraizer and Jon Dahmer. 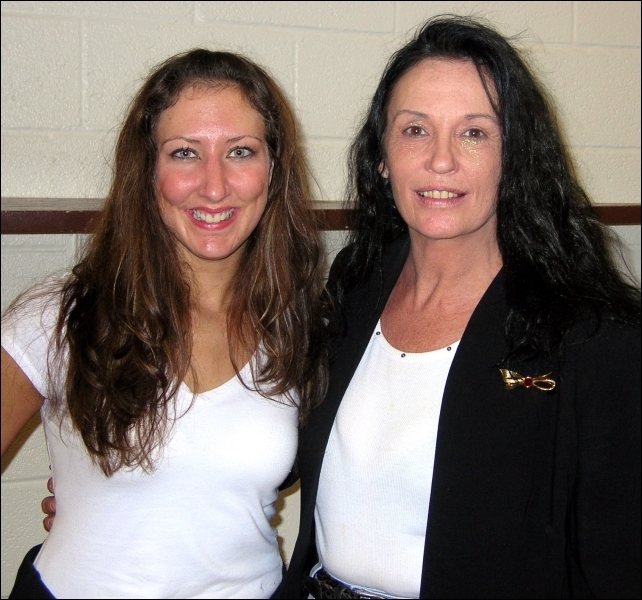 Career Highlight: Working with Sherri Martel. Wrestling Ambition: To be around forever, whether it's in the ring or behind the scenes. But I refuse to retire until my little body completely gives out on me! I try to dabble in as many aspects related to wrestling as possible. I'm very close with my family. I'm rather accident prone (I fractured my spine, broke my jaw and fractured my sternum all while wrestling, but at different times). I lived in Germany as an exchange student. My favorite colors is white. I love to go white-water rafting and parasailing. I managed my high school wrestling team for 3 years (because they wouldn't allow girls on the team). I'm absolutely obsessed with wrestling and can't imagine my life without it! Kylie moved to Nashville for a few months and has been working shows down south for a bit, but look for her to make a return to Northern indy shows soon!